"Let's Twist Again" is the twenty-eighth comic issue, which was released 29 November, 2006 in the US. Zoidberg steals Hermes' sandwich so Hermes chases him. 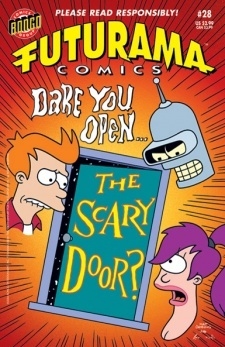 Fry, Bender and Leela watch The Scary Door and Professor Farnsworth announces that they will make a delivery to The Scary Door offices. It is revealed that there is only one writer who gets his ideas from a parallel universe where everything is ironic. Bender attaches a cold fusion generator to where the parallel universe is viewed and Fry, Bender and Leela are transported to the universe. The Planet Express crew are split off from each other. Leela goes to a diner and meets Death who is actually very handsome and she has dinner with him. Bender sells his legs for beer and replaces them with chicken legs. Fry meets a talking doll who tries to prove she is more evil than Bender but ends up getting hit by a train along with Fry. Bender is offered a million dollars and steals it. Fry is in the afterlife and gets everything he ever wishes for. Bender takes his money to a pawn shop and buys a watch that stops time. He discovers that nuclear missiles are headed for earth and tries to disarm them. Death proposes to marry Leela but the nuclear missiles blow up ten billion people and Death has to leave Leela. Bender heads to an adult bookstore and his eyes fall out. The people in the afterlife try to prove to Fry that he is in hell not heaven and it's boring getting whatever he wants. Fry wishes that he, Bender and Leela can go home but they end up in a zoo along with Zoidberg. Doll: I pushed my last owner's daddy down the stairs. Fry: One time, Bender pushed me down an escalator that was going up. I was falling down it for almost an hour. This page was last edited on 28 March 2014, at 18:26.